New Caledonia won the men's football tournament at the recent Pacific Games, which was held in Port Moresby, Papua New Guinea. Les Cagous defeated Tahiti 2:0 in the final, which was held on 17/07/15 at the Sir Hubert Murray Stadium in the Papuan capital. A first-half goal from Jim Ouka and a penalty from substitute Raphael Oiremoin with a quarter of an hour to go were enough to ensure first place for the New Caledonians for the third time in a row and the seventh time in total. The tournament, which ran from 03/07/15-18/07/15, featured eight teams: hosts Papua New Guinea, New Caledonia, New Zealand, Tahiti, Solomon Islands, Fiji, Vanuatu and, for the first time since 2003, the Federated States of Micronesia (FSM). It was expected that Samoa, the Cook Islands, Tonga, American Samoa, Tuvalu and Kiribati would also send teams, but elected not to do so. It was announced at an OFC meeting in March 2014 that the tournament would not serve as a qualifying mechanism for either the OFC Nations Cup or the 2018 World Cup. It was, however, agreed between the OFC and FIFA that the tournament would serve as the qualification route for the 2016 Olympic Games football tournament, and this was agreement was rubber-stamped in April 2015. So, there would be no full national teams on view, but under-23 sides. Fiji, the FSM, Tahiti and Vanuatu were drawn together in Group A, whilst Group B comprised of New Caledonia, New Zealand, Papua New Guinea and the Solomon Islands. Five teams (Fiji, New Zealand, Papua New Guinea, the Solomon Islands and Vanuatu) would be involved in Olympic qualification, which was in essence a competition in part within a competition, with the semi-finals being held on 10/07/15 and the final due to take place on 12/07/15. These matches, like all but two of those in the Pacific Games competition, took part at the Basini Sports Complex. The Pacific Games tournament - and Group A - kicked off with Tahiti taking on the FSM, and it was a result which sent media of all sorts the world over into a bit of a tizzy. Unfortunately for the Micronesian team, it was one which provided the wrong sort of headlines. Ten goals down at half-time, they eventually lost 30:0 to their more experienced opponents. The group's second game of the day between Fiji and Vanuatu ended in a 1:1 stalemate. Two days later, Tony Tuivuna scored ten goals and team-mate Chris Wasasala hit nine as the Fijians swamped the FSM in their next fixture, scoring 38 goals without reply after being 21 goals to the good at half-time. Fiji manager Carlos Buzzetti apologised to his FSM counterpart Stan Foster and his charges after the game, saying that he felt "very bad" about having to score so many goals to better Tahiti's total against the FSM should goal-difference come into play. Tahiti bettered their goal-difference by a single goal in their second game when they defeated Vanuatu 2:1. Fred Tissot, who hit six against the FSM, and Manuari Hauata countered Vanuatu's opener. As Tahiti were due to play Fiji in the afternoon game on 07/07/15, Vanuatu had to score more than 38 goals against the FSM to have any chance of qualifying for the semi-finals and hope that the Tahitians and Fijians would each do the decent thing and go for a win. Vanuatu were 24-nil up at the break and simply did not let up. Jean Kaltack scored 16 goals to surely set a new world record at under-23 level for the most goals scored in a single match; team-mate Bill Nicholls also got into double figures, scoring ten. Meanwhile, one could have been forgiven for thinking that both Tahiti and Fiji would be merely going through the motions in their match. Not a bit of it. It was a physical encounter which see-sawed one way, then the other, a game that ended with nine Tahitians left on the pitch and, more pertinently for the Vanuatu side, goalless. As a result, Vanuatu were knocked out of the Pacific Games, but had the consolation of qualifying for the semi-finals of the Olympic qualifiers as group winners Tahiti are not IOC members. In comparison to Group A, Group B was starved of goals and, for the most part, there was not much between any of the four sides. The Solomon Islands lost all three of their games, 2:0 against New Zealand and by the odd goal against both New Caledonia and Papua New Guinea in their final game. The hosts, managed by none other than New Zealand's manager at the 2010 World Cup Ricky Herbert, lost both of their matches against the All-Whites and Les Cagous 1:0, so the win against the Solomons was at least of some consolation. Everything was set up, then, for what promised to be an attractive, winner-takes-top-spot fixture between New Zealand and New Caledonia on 07/07/15. New Zealand went straight for the jugular, and Te Atawhai Hudson-Wihongi put them ahead in the thirteenth minute. Logan Robertson made it 2:0 on the half-hour, and Luka Prelevic put the game more or less beyond Les Cagous' reach with a third after 47 minutes. Robertson went on to claim a fine hat-trick with goals in the 61st and 68th minutes as the Kiwis won at a canter. Both teams qualified for the semi-finals of the Pacific Games, but, as New Caledonia are not members of the IOC, their place in the semi-finals of the OFC Olympic mini-tournament was taken by Papua New Guinea. Sadly for the hosts, their participation in the Olympic competition didn't last long, as a Napolioni Qasevakatini hat-trick for Fiji put paid to the PNG side's hopes of reaching the final. In the other semi-final, New Zealand defeated Vanuatu 2:0 to set themselves up for what many would have thought to be a fairly straightforward route to Rio..or so you would have thought. The Vanuatuans claimed immediately after the semi-final that two players in the New Zealand panel, Decklan Wynne and Samuel Burfoot, were ineligible to play in the tournament because they had not lived for more than five years in New Zealand. Only the South African-born Wynne had actually played in the game against Vanuatu, but this was enough for the Vanuatu team manager to lodge an appeal with the OFC to have the result overturned. After some hurried deliberation, the OFC Discipllinary Committee ruled in favour of the Vanuatu FA, citing Article 73, Paragraph 1 of the OFC Disciplinary Code (and FIFA Statute Regulation Article 7(d)) as the reasoning behind their decision. New Zealand were out, only because someone at New Zealand Football didn't do their homework before the semi-finals took place. The Olympic qualifying final took place on 12/07/15, and it would be a historic first appearance at an Olympic Games for either Fiji or Vanuatu. It was tense, and despite both teams enjoying long periods of possession, no goals had been scored during the 90 minutes. Vanuatu had perhaps the better of extra-time, but the game remained scoreless. The score was 3:3 after both teams had each taken their regulation five penalties, but Remy Kalsarap put Vanuatu's sixth penalty wide. Jale Dreola put the ball low to the right of Selonie Iaruel in the Vanuatu goal to put Fiji through to an Olympic final tournament for the first time ever. Fiji's luck ran out in their Pacific Games semi-final, however, when they lost 2:1 to New Caledonia. As New Zealand's national sports body isn't a member of the Pacific Games Council, the All-Whites were unable to take part in the Pacific Games, even though they had won their group. So, the other semi-final was between Tahiti and Papua New Guinea, and the 2012 OFC Nations Cup winners prevailed by the odd goal in three to reach their first Pacific Games final in 20 years. Both the third-place match and the final took place on 17/07/15 at the 25000-capacity Sir Hubert Murray Stadium, and the hosts picked up their first football medal at the Games in 28 years when they beat Fiji 2:1. Patrick Aisa put Papua New Guinea in front in the fourth minute but Tuivuna put Fiji back on level terms in the 50th minute. Fiji perhaps deserved the bronze medal, but Alwin Komolong scored the winner in the first minute of injury-time to send the home crowd into raptures. It was the fifth time that New Caledonia and Tahiti had squared up to each other in a Pacific Games final, and, as the New Caledonians had won the previous two editions (with a rather different squad, it has to be said), many would have considered them to be slight favourites. It was certainly tight enough in the early stages, but Jim Ouka put New Caledonia in front after 30 minutes, and they went on to dominate the rest of the first half. The second half ebbed and flowed, but with 15 minutes to go, Tahitian defender Tevaimona Teslien brought down Raphael Oiremoin in the box. Oiremoin dusted himself off and sidefooted his spot-kick to goalkeeper Temauiarii Crolas's left and, in spite of a late rally from their opponents, the New Caledonians were home and dry. Apart from New Zealand, New Caledonia were probably the strongest side on view at the Pacific Games men's tournament, but the All-Whites only have themselves to blame for missing out on a spot at the 2016 Olympics in Rio de Janeiro. Still, both Les Cagous and Fiji deserve congratulations for jobs well done. Of course, the tournament was overshadowed by the attention given to the three heavy defeats suffered by the Federated States of Micronesia team, and the old chestnuts such as their being "the worst team in the world" and a "pub team" were dragged out yet again. (I think we've been down this road before somewhere on this blog.) Fortunately, the FSM's 46:0 defeat at the hands of Vanuatu does not qualify as the record margin of defeat in full international football as they were taking part in an under-23 competition, nor is the FSMFA part of the FIFA family, at least, not at the moment. And there, perhaps, lies the crux of the problem. There is very little money in football in the Oceania region, and still less in Micronesian football. As the FSMFA is not a member of FIFA, it does not qualify for grants or loans from the organisation to help develop its infrastructure in any way. And, as things stand, due to the ham-fisted criteria that FIFA now employs, due to a lack of infrastructure, the FSMFA are unable to become FIFA members. As a result, it rarely gets the chance to send a team anywhere for friendlies or tournaments, so local players lack the experience of participating in international competition. After years of piecemeal organisation, the FSMFA has, in recent times, started to progress, both administratively and on the field, with youth and adult leagues being organised on three of the four main islands. After years of arranging, and then cancelling, visits to the Federated States of Micronesia, a representative of the Asian Football Confederation finally showed up on the island of Yap in mid-July. There is no news yet of whether the visit has been a success, but there will, all being well, more on that here shortly. The fact that Tuvalu and Kiribati did not send a team to the Pacific Games perhaps, in its own way, ties in with the fate of the FSM team at the Games. As ramshackle as it may be at times, and irregular as regional air-travel schedules may be, all three countries - and, indeed, Palau - have the basic infrastructure to enable their football associations to become FIFA members, and it is hardly their fault that they are all caught in the same Catch-22 situation. FIFA has money enough to help move football on in all four countries, and giving them association status and grants for infrastructure development would be a start. But, all of this, too, is for another time, soon. Well done to New Caledonia and to Fiji for their achievements in the two tournaments, but well done, too, to the team from the Federated States of Micronesia, for being there, for picking themselves up off the floor after each heavy defeat and for being willing to go through it all again. The team took part in the competition, they did their best. And, they did so in a sporting manner. Their defeats, although frighteningly heavy, have brought the question of developing football in the FSM and elsewhere into the spotlight, however briefly. For all of that, the team and all involved with the FSMFA deserve praise, and much more. They deserve help to develop football in the country, and that must come soon, and be rolled out across the Pacific region. Please find below the results from the Pacific Games Men's tournament, and those of the 2016 Olympic Games Oceania qualifiers. AUTHOR'S NOTE: Most of the above information was obtained from the OFC's website; many thanks to them as always. Several other sources were also checked for information, such as Wikipedia. There will be a more expansive (opinion) piece on football in the FSM to come shortly. Should you wish to show your support for the development of football in the Federated States of Micronesia, you could do worse than copy the link below, sign the relevant petition on change.org, and forward it for fellow football-lovers and people of good heart everywhere to sign. Said petition, set up by none other than Paul Watson, "Up Pohnpei! ", and Matthew Conrad, both of whom were instrumental in spreading the word on Pohnpeiian - and Micronesian - football a few years ago, calls for the FSMFA to be admitted to FIFA in order for the game to develop and flourish in the country. "Small but perfectly formed" was the mantra as far as the stadia used during the Women's 2013 European Championship were concerned. Seven stadia were used, and with the exception of the Friends Arena in Solna, venue for the final between Germany and Norway, and the Gåmla Ullevi in Göteborg, the capacity of any given stadium was no more than 12000. FRIENDS ARENA, SOLNA: Just about everybody reading this will remember Zlatan Ibrahimovic's audacious strike for Sweden against England in the first-ever football match to be held at the Friends Arena on 14/11/12, but the stadium was officially opened just over two weeks earlier, on 27/10/12. Work on the stadium, which was originally called the Swedbank Arena, commenced in May 2009, and the name changed in March 2012 when Swedbank "donated" the stadium's naming rights to Friends, a Swedish anti-bullying charity with which it is heavily involved. The Friends Arena is co-owned by the Svenska Fotbollförbundet (the Swedish FA), Solna city council and a number of Swedish companies. The stadium, which is all-seater and mulit-purpose with a retractable roof, has a capacity of 50000 for football and bandy matches, but can hold up to 75000 people. There are 26 executive boxes, the largest of which can hold 150 people. It is also used as a venue for conferences and exhibitions, large and small, and contains a number of bars, restaurants and fast-food kiosks. There is even a ring-road underneath the stadium to facilitate the transportation of equipment used in constructing stages and sets. 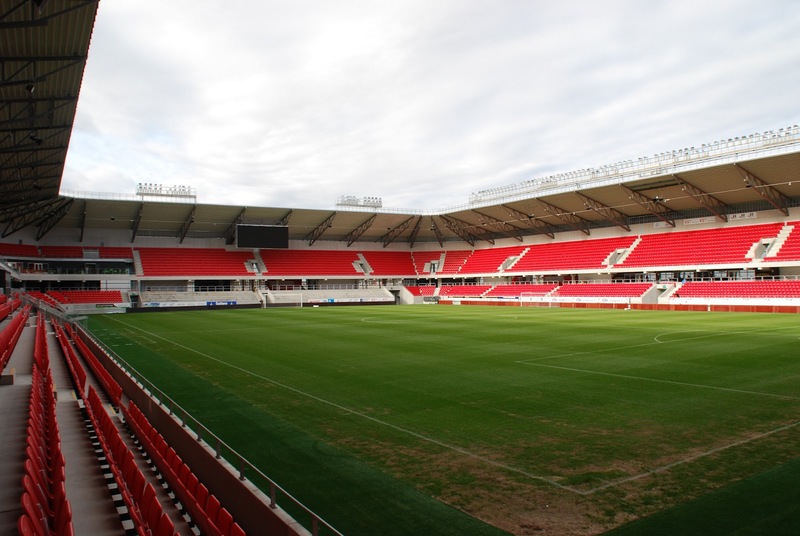 MYRESJÖHUS/VÄXJÖ ARENA, VÄXJÖ: This small yet attractive stadium, completed in August 2012, hosted four matches during the tournament, and has a total capacity of 12000 people, of which 10000 are seated. The stadium is largely constructed of materials which have been locally sourced, such as glass and wood, and it is situated only a 15-minute walk from the centre of Växjö, which hosted the city's Fan Zone. 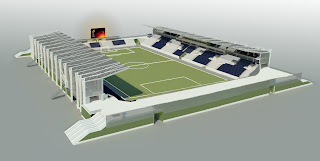 The stadium's restaurant has a seating capacity of 500, while there is also a members' lounge and supporters' pub. For those with a few krona to spare and guests in tow, there are also 16 executive boxes, each with a capacity of 10 people. The pitch itself measures 105 metres by 68 metres, and the surface consists entirely of natural grass. NYA PARKEN, NORRKÖPING: The Nya Parken, situated in the city of Norrköping, dates from 1903 and was renovated on a number of occasions, most notably for the 1992 European Championship before it was rebuilt in 2009 with a current capacity of around 16000. The ground, known to supporters of the three clubs which share the ground (IFK Norrköping, IF Sylvia and IK Sleipner) simply as "Parken," has seating on three sides, with terracing on its south side. Nya Parken has 16 executive boxes, 3 bars and 2 restaurants, and occasionally hosts concerts in its indoor sports arena stroke training area (Teknikhallen). The pitch has an artificial surface, but this was temporarily removed before the Women's Euro 2013 to enable a grass pitch to be laid in its place until after the tournament ended. IFK Norrköping bought Nya Parken from the local council in 2010. GULDFÅGELN ARENA, KALMAR: The south-eastern city of Kalmar played host to four matches during the Women's Euro 2013, and they took place in the Guldfågeln Arena, which has a capacity of 10696 (all seated) but which can rise to 15000 to accommodate concerts. 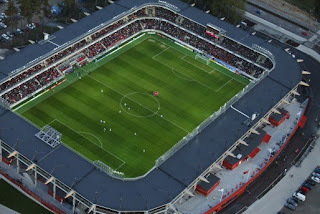 The ground was opened in March 2011 and was jointly financed by local Allsvenskan club Kalmar FF and the local council. The Guldfågeln Arena also has a pub with a seated capacity of 300, a lounge which can potentially host 1000 people, executive boxes and a restaurant. Journalists are also well catered for; 50 people can fit into the press-box, and there is also an on-site television studio. GÅMLA ULLEVI, GÖTEBORG/GOTHENBURG: Before Aberdeen fans get all misty-eyed at the very mention of Gothenburg's Ullevi Stadium, scene of The Dons' victory in the 1983 Cup-Winners' Cup final against Real Madrid, in this article, it should be pointed out that the Ullevi Stadium which hosted that particular game is officially known as the Nya Ullevi (or New Ullevi), and was built with the 1958 World Cup in mind. A stone's throw away from the Nya Ullevi is the Gåmla Ullevi, or Old Ullevi, the original incarnation of which dates from 1916, but which was razed in 2007 and completely rebuilt; the new version of the stadium was completed in 2009 and has a seated capacity of 16596 (the overall capacity is 18416). The stadium is home to the "Gothenburg Alliance;" in other words, the city's three biggest clubs, IFK Göteborg, GAIS and Örgryte IS. Gåmla Ullevi is also the national stadium as far as Swedish women's football is concerned. Facility-wise, the stadium has 2 restaurants and 27 executive boxes; the pitch itself has a natural grass surface and measures 105 metres by 68 metres. Gåmla Ullevi is situated pretty much slap-bang in Gothenburg city-centre and is just a five-minute walk from the city's main train station. ARENA LINKÖPING, LINKÖPING: The Arena Linköping, situated in the city after which the stadium was named, is a very recent phenomenon and its construction was only completed some four months ahead of the start of the Women's Euro 2013. The 8300 capacity stadium was the smallest venue to play host to the tournament, and it is unique in that, immediately the Women's Euro 2013 reached its conclusion, it became the home for the city's main football team, Linköpings FC..which plays in the top-flight of Swedish women's football. ÖRJANS VALL, HALMSTAD: This is perhaps the only ground out of the seven used for the Women's Euro 2013 which still looks pretty much like it did when it was built back in 1922. Owned by Halmstad city council and built to help alleviate unemployment in the area, Örjans Vall was officially opened on 30/07/22 by Crown Prince Gustav Adolf. The ground was named after a hospital dating from mediæval times - St. Örjan's Hospital - which had been built where the entrance to the stadium now lay. The stadium was the venue for two matches in the 1958 World Cup, both featuring Northern Ireland, and possessed an athletics track until the 1980s. (Its outline can still be seen from above.) 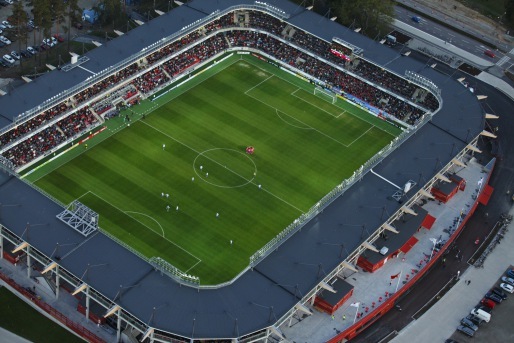 It is currently home to two teams, Halmstads BK and IS Halmia, and has a capacity of 15500, and possesses two restaurants and a pub. Halmstad city council is due to begin to renovate much of the stadium in the autumn of 2015, with particular emphasis on basically rebuilding the main stand to include new press facilities, a VIP lounge and better facilities for disabled supporters. The project is expected to reach completion next summer. AUTHOR'S NOTE: Many thanks to the individuals named in the above article who contributed information on - and images of - some of the stadiums covered in said piece. Other information was taken from the various websites related to the stadiums themselves, and, where appropriate the relevant city councils and football clubs.